A glaucoma update was organized by Allergan at Le Meridian Hotel, Kuala Lumpur, Malaysia on 20th January 2018. The highlight of the update was the presence of Dr Anders Heijl from Sweden. A name who requires no introduction, Dr Heijl has worked extensively on visual fields: developing SITA for the Humphrey perimeter, the Visual Field Index (VFI) and now the revolutionary SSY engine to determine target intra-ocular pressure (IOP). The update started with a talk on "Glaucoma through the eyes of patients" by Dr Lee Ming Yueh. This was followed by a presentation by Dr Aziz Husni on "Use of structure and function in clinical decision making in glaucoma". After a break, Dr Heijl spoke on "Modern Glaucoma Management in Europe". (1) His team conducted a study in Sweden to assess the "Lifetime risk and duration of blindness in patients with manifest open-angle glaucoma (OAG)". According to the study, published in "Ophthalmology" journal, it was found that at the time of death 42.2% of the glaucoma patients were blind in one eye and 16.4% were blind in both eyes. This means that nearly half of the patients being treated for glaucoma ultimately ended up being blind atleast in 1 eye. Thus, if we extrapolate this data world-wide, it would indicate that the number of patients blind from glaucoma should be much higher compared to epidemiologic studies conducted by others. This would be an eye opener for ophthalmologists, administrators and NGOs. This data needs to be brought to the notice of those who allocate funds for glaucoma care. (2) Patients in Dr Heijl's study, as well as some other studies, had apparently well controlled IOP. This shows that there are other factors apart from IOP which can cause optic nerve damage and lead to blindness. So far most of our efforts have been focused on reducing IOP. These include pharmacologic, laser, surgical and other means such as MIGS and Glaucoma Drainage Devices. Not much is being done to protect the nerve (neuroprotection), investigating the role played by other causes of glaucomatous optic atrophy (vascular, biochemical etc) and neuro-regeneration following optic nerve damage. This lop-sided focus on reducing only IOP is contributing to a quantum jump in blindness from this disease. Dr Heijl's second talk was titled "SSY engine in practice". The SSY engine is an app to be used on computers and tablets. Like the glaucoma risk calculator, the app is a simple calculating algorithm. It uses data on measured rate-of-progression, current field status, patient's current age and at diagnosis, as well as measured IOP values. The user can simulate different future rates of progression and see future IOP levels associated with those rates. This helps in better target IOP settings depending on the expected life-span of the individual. 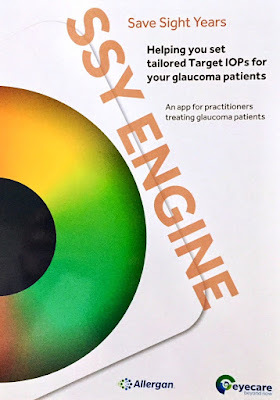 The app is to be used when the measured rates of progression are available and the treating ophthalmologist is not content with the results. So, this app cannot be used at the time of diagnosis as we do not know the rate of progression at that time and would be useful after 2-3 years of diagnosis when rate of progression is more evident. The program was followed by a sumptuous dinner. Thanks for your information. May God save us all from such dangerous disease. It is very necessary to visit the eye doctor at regular interval. Vision plans are made to reduce the treatment cost of ophthalmological disease by giving discount.